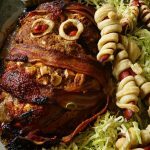 Mummy Meatloaf and Mummy Hotdogs – fun food for the kids on Halloween! Wrapped in bacon and slathered with sauce this is a meatloaf you can serve for any Sunday dinner. Ah… minus the decoration of course! 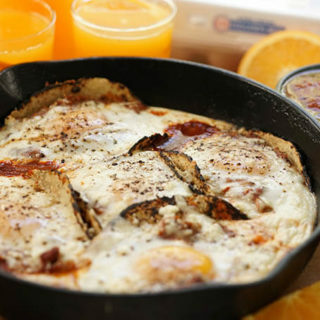 Our family meatloaf recipe is delicious and easy. Dressing it up on Halloween? Why not! 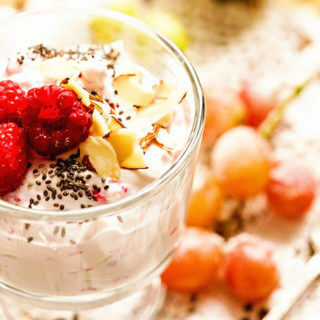 Who says you can’t have fun with your food? 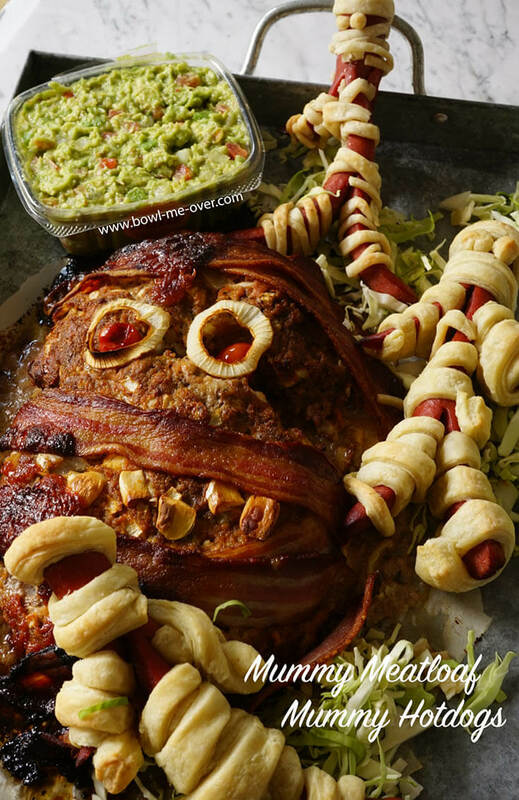 Mummy Meatloaf and Mummy Hotdogs are on the menu for Halloween this year! Mummy Hotdogs are super easy. 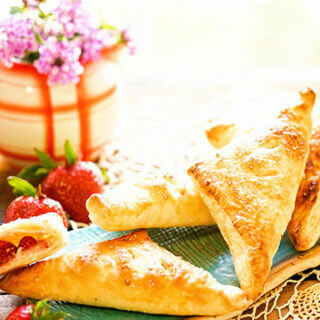 Puff pastry and hotdogs – that’s it! Slit the hotdogs down the middle about halfway down to make “legs”. Next make arms by starting about an inch from the top, slicing downward and angling out. Make the opposite arm also. 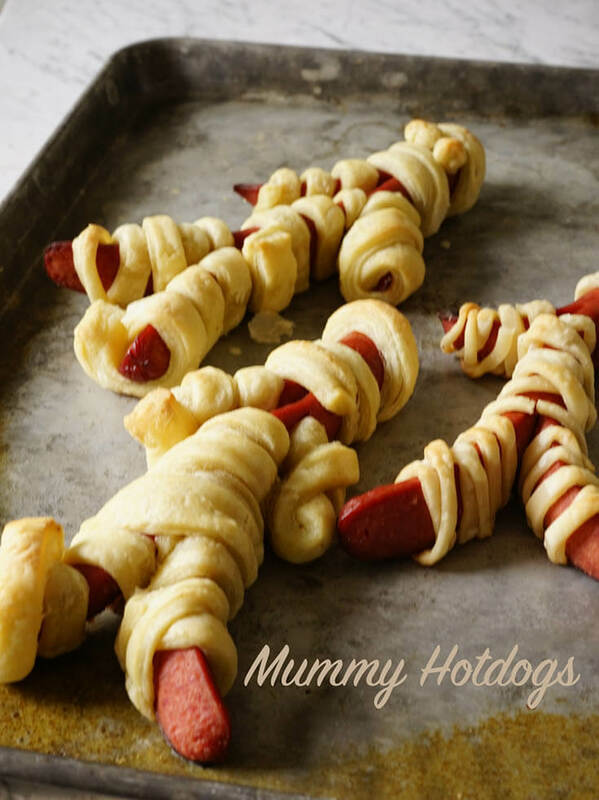 Mummy Hotdogs, the kids are going to love these! Thaw the puff pastry. Slice it into thin strips – no need to be accurate! Wrap the strips around the “limbs”, body and head. Brush each mummy lightly with water. This will help them brown. Bake in the oven for 15 minutes at 375 or until the pastry is browned. No puff pastry? 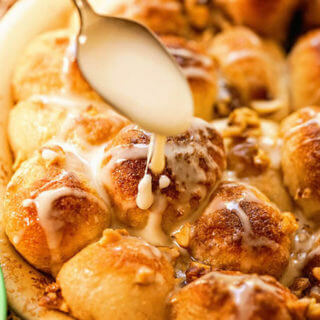 No problem – use pie dough, gives you the same effect, it just won’t puff up like the pastry! Ok – let me tell you how this came to be….I’ve always said Corliss’s have the most fun and no matter what it is, we can always find a fun way to have a good time! My Uncle’s Birthday was right around Halloween. We lost him to cancer a few years ago. It’s become a tradition for the family to get together and celebrate his life with laughter and fun! 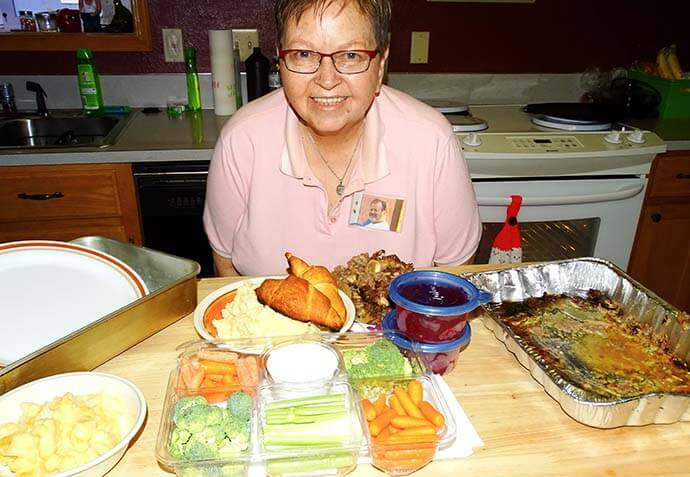 Aunt Shirley’s is in charge of this shindig and she always puts on quite the feast. 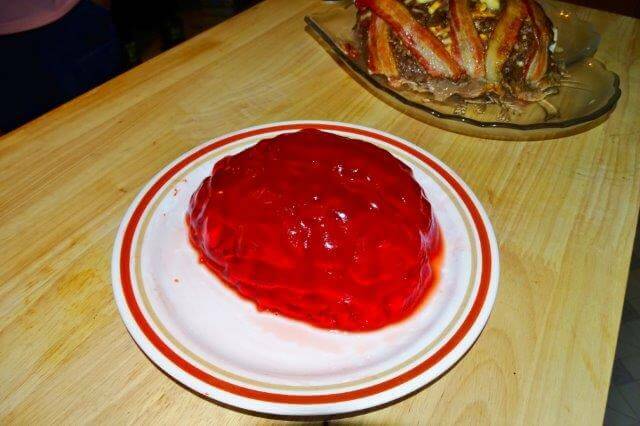 Jello brains – sugar free jello and a “brain” mold – how fun is this?!! Fun things like cutie tangerine pumpkins! 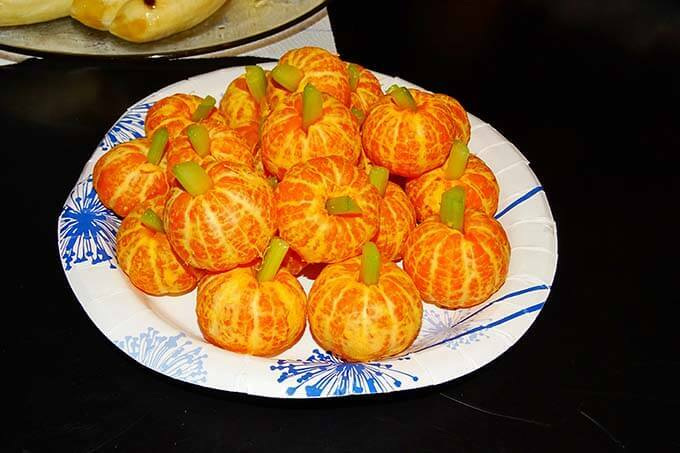 Tangerine Pumpkins – just peel the tangerines and insert a little piece of celery in the crown. And Ghost Bananas – oooh….scary! 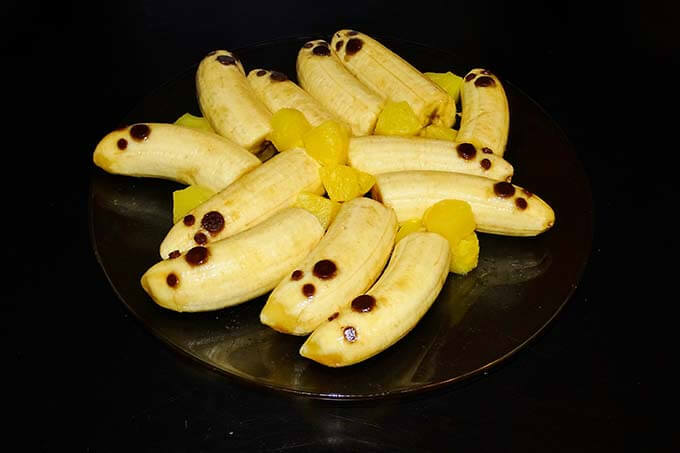 Banana Ghosts – peeled bananas with chocolate chips – large for the mouth & small for the eyes, just push the point in so it stays in place. But the star of the show……is the meatloaf! Shirley and the Mummy Meatloaf! Eeek! Is that gruesome or what? Gruesomely delicious that is! 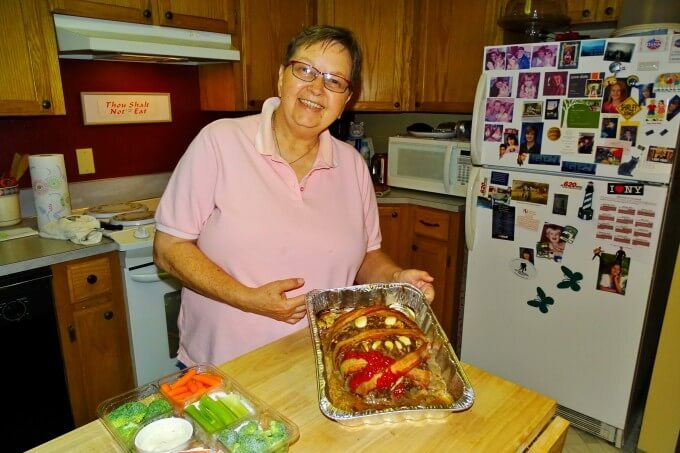 She made her favorite meatloaf, wrapped it strategically with some slices of bacon, made eyes and teeth with cloves of garlic and baked it in the oven. It was finished off with a little strategically placed ketchup! A pinch of this, a handful of that is how the best meatloaves are made! 1 cup bread crumbs or crushed crackers (saltines, Ritz, etc. Mix together the all of the ingredients. Mix to combine, but do not over-mix. 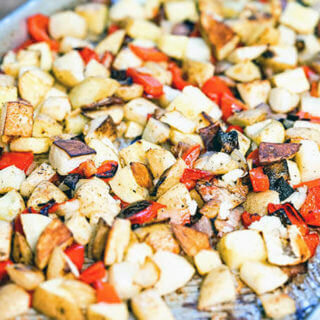 Place parchment paper on a rack above a pan. Poke holes in the parchment paper to allow the fat to drain. Shape the meatloaf into an oval. Add slices of bacon to "wrap" the mummy as pictured. Use onion rings, olives, sliced garlic and cherry tomatoes to make eyes and mouth. Mix together brown sugar, ketchup and mustard and slather over the mummy, have fun with it! Ha, Ha — too much fun. You Corliss’s DO have fun. My fave are the tangerine pumpkins though. I love those little guys too, one of my favorite fruit Nancy!! I’m so sorry that you lost your Uncle, but how lovely to celebrate his life like that. All the recipes look like fun especially the Mummy Meatloaf! Thank you for sharing this post with us at Hearth and Soul. You are very welcome April – I always enjoy your Link Party!!! I am so so sorry to hear about your uncle. It sounds like he was a wonderful person. This mummy recipe is so creative and just perfect for Halloween. Have a happy Halloween. Happy Halloween to you too! And thank you for the wishes, Uncle Chuck was great – it’s good to remember the good times! This whole meal is adorable. I love those Tangerine Pumpkins & the mummy hot dogs. All of it is super creative & super kid friendly. So fun Debi, my Aunt does this every year! It’s an event the whole family looks forward to! What a wonderful way to celebrate your uncle’s life! That meatloaf would be yummy anytime! Such a fun, creepy idea. This is such a great idea for a Halloween dinner because my kids will eat it well and it will give them something good before the sugar rush! Exactly, right Amy? Happy Halloween to you & yours! 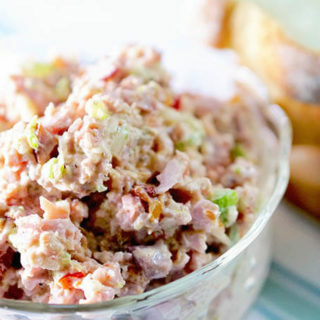 You are so lucky to have Aunt Shirley to share such fun recipes in memory of your uncle! 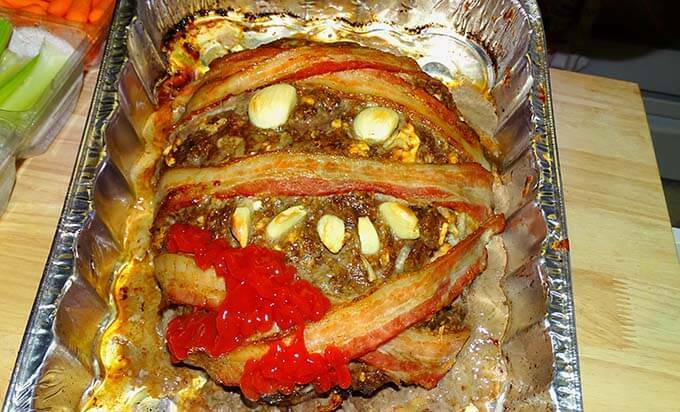 I may have to make that meatloaf mummy for my kids…who cares that they are in their 20’s, right haha! They’ll love this dish. Meatloaf is a family favorite and how cute is this going to be for our annual neighborhood party! SO so much fun! This is such an awesome idea for dinner on Halloween! I can’t wait to try this! This is the ultimate spread for Halloween with something for everyone!